I obtained seed of this species at the 2001 AGGS convention in Kansas City. 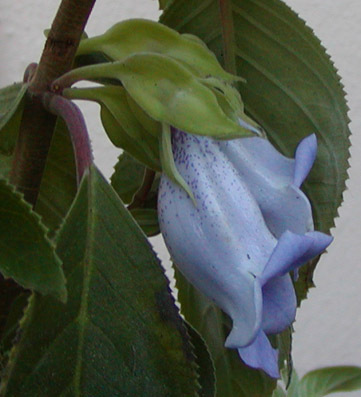 At the end of November 2005, one of the seedlings finally broke my string of never having bloomed a paliavana. These plants do get large. The blooming one is in a 14-inch [36-cm] pot, and is more than 1 m [3 feet] tall, with buds only in the upper axils. The flowers are definitely larger than most in the Sinningia tribe. The flower in the picture is 6.5 cm [2.5 inches] long. Notice that they are pulling the same trick as Sinningia guttata: the pedicel bends so that the flowers on both sides of the stem face the same direction. End of November. You have to wonder what the plant is thinking. It's cold at the brink of winter, and whatever bees are left are hidden away in their hives. I mean, what's wrong with late summer? This plant survived all the winters between the time I started it and 2006, but the freeze of January 2007 did it in. It was in a tub 14 inches in diameter, which should have sheltered the roots some, but obviously not enough. Many other apparently dead plants revived in the months after the freeze, but not this one. Paliavana prasinata -- I didn't miss it. This one I'll miss. It didn't have enough flowers for its size, and it flowered at an inconvenient time of year, but still, the flowers were large, attractive, and dramatic. 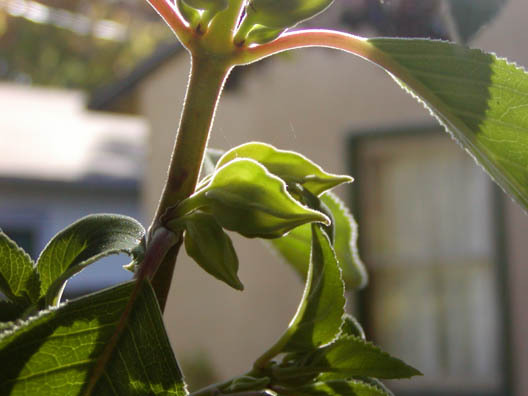 In the picture above, you can see that the calyx lobes of Paliavana tenuiflora are valvate and completely enclose the corolla bud. This is a trait it shares with Vanhouttea lanata and Vanhouttea brueggeri, but not with Paliavana gracilis or Vanhouttea pendula. The molecular DNA evidence suggests that P. tenuiflora is more closely related to V. lanata and V. brueggeri (members of the Sinningia clade) than to P. gracilis or V. pendula (members of the "free calyx-lobes vahouttea clade"). The picture also shows that this species too has the gesneriad family's characteristic pair-flowered cyme. Leaves Green, serrated, at least twice as long as wide. Petioles about 2 cm long, dark red. Hardiness The leaves have survived 32 F (0 C) in my yard, but turned black and fell when the temperature dropped to 30 F (-1 C). A large flowering shrub which had survived previous winters was killed by the Five Night Freeze in January 2007. Recommended? Yes, with reservations. It requires a lot of space and plenty of time. The flowers are handsome but not abundant. Taxonomic group In a paliavana subgroup of the Sinningia clade. For a very handsome flower and some habitat information, see the page on Mauro Peixoto's web site. By Rudolf Mansfeld, in 1935. From Latin tenuis ("thin, delicate, insignificant") + -flora ("flower").